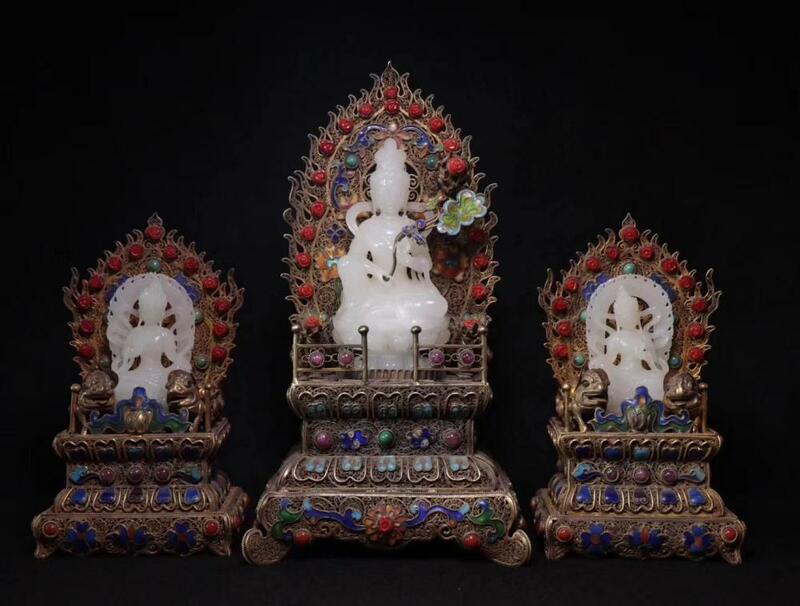 Featuring fine antique Chinese porcelains, a large collection of porcelain antique, jade and soapstone carvings, bronze items including edged weapons. When you register the auction, Empire auction needs bidders to provide full name, phone number, email and Credit card information to empireauction@yahoo.com. We will charge $500 for an auction deposit which is returned after an auction end. If a bidder wins lots, the deposit would be returned after an invoice paid. All Invoices Will Be Charged To The Credit Card On File Immediately Following The Close Of The Auction. Payment must be received within 3 days after auction ends. If the buyer fails to pay within 3 days, Empire's Auction reserves the right to re-offer the items and will hold the bidder responsible for any loss or other fees or damages incurred. Description about the period is Consignors' opinion and should in no way be construed as a guarantee. All properties offered and sold through Empire Action House shall be offered and sold on the terms and conditions set forth below. By bidding at the auction, whether present in person or by agent, by absentee bid, telephone, internet or other means, the buyer agrees to be bound by these terms and conditions. 2. A 26% buyer's premium will be added to the hammer price of each lot for bidders. 3. We recommend Internet bidders register at least 48 hours prior to an auction to give enough time to process and approve their registration. a. Individual clients must provide photo identification (such as Driver's license, National ID Card, or passport) and if not shown on the ID document, proof of your current address. b. Corporate clients must present a Certificate of Incorporation or equivalent documents verifying identity. Returning Bidders may be asked for current identifications. The bidding process will be explained to bidders prior to an auction. All bidders shall obtain a bidding number prior to the start of the auction. All bidders shall keep the number under his/her safe custody. The number shall not be lent to any other person(s). Otherwise, he/she shall bear all the responsibilities associated with the use of his/her number for bidding or any other use. If there are any questions, please contact us at 617-936-3128. 4. Though all description and commentary are believed to be correct, neither the auctioneer or the consignor makes any guarantee of the authenticity of the merchandise. Any descriptions, condition reports, and any other statements are our opinions and are not to be relied upon as facts. No employees are authorized to make any warranties of any kind on behalf of Empire Auction House. Potential buyers must rely only on their own inspection of the merchandise. Empire Auction House offers free previews and high resolution photos for potential buyers to review and make their own conclusions about the piece. a. NO GUARANTEE OF AUTHENTICITY FOR CHINESE STAMPS, COIN, PAPER CURRENCY AND/OR CHINESE PAINTINGS: Description, illustrator, and conditions for Chinese stamps, coin, and/or paper currency are provided as reference and are not guaranteed by Empire Auction House, also not guarantee any descriptions concerning Chinese paintings, including authentication, artist and the date of execution. All items sold as is, no returns. 5. All purchases (including buyer's premium) will be subject to a NY State Sales Tax of 8.875%, unless lots are being shipped out of state, or if the purchaser has a valid Tax Exempt or Resale Certificate (an actual resale certificate must be presented or a copy held on file with Empire Auction). 6. All telephone and left bid buyers must provide a credit card to secure a bidding number. Once the bidder wins the item being auctioned, he/she will receive an invoice by email within 24-48 hours with instructions regarding payment and shipment of the item. Empire Auction House reserves the right to require up to 20% deposit from telephone and left bidders bidding on items valued in excess of $10,000. 7. We accept payment by credit cards (MC, Visa, AE and Discover), check, cash, wire transfers, etc. All payments shall be made in US Dollars. Buyers can only collect lots after their balance due is paid in full. Should payments be made by check or draft, lots will only be released after bank clearance. PAYMENT MUST BE RECEIVED WITHIN 6 DAYS OF THE AUCTION. If the buyer fails to pay within 6 days, Empire Auction House reserves the right to cancel the sale and reoffer the items and will hold the bidder responsible for any loss or other fees or damages incurred (Buyers are required to pay a 10% of the hammer price as Liquidated damages). Title transfers only when Empire Auction House receives full and clear payment of the purchase price and any associated fees. 8. All properties purchased from Empire Auction House must be collected or shipping arrangements made within 45 days of the auction. Empire Auction House is not responsible for paid items left for over 45 days after the auction date (unless a prior agreement has been made). Items left past 45 days will incur a storage fee of $10.00 per day per item. Once storage fees have exceeded the actual purchase price of the item(s) Empire Auction House can exercise the right to re-auction. 9. All items are sold to the highest bidder acknowledged by the auctioneer. The auctioneer is the arbiter of any disputed bid. He may reopen bidding at his discretion and reject bids deemed inappropriate. The auctioneer reserves the right to withdraw any item and to reoffer the item at another time. Every effort is made by the auctioneer to execute all bids, including floor, absentee, telephone and internet bids. We are not responsible for any missed bids. Empire Auction House reserves the right to cancel any sale or bid before, during, and after the auction. 10. Some properties sold at auction may include materials from protected or endangered species subject to laws governing imports and exports to or from the United States or other countries. Obtaining of licensing for import or export of goods from local authorities is the sole responsibility of the buyer. Denial or delay of receiving an import/export license will not constitute grounds for cancellation or delay in payment for the total purchase price of lots. Buyer is responsible to ensure payment is processed and completed. All purchases (including buyer's premium) will be subject to a NY State Sales Tax of 8.875%, unless lots are being shipped out of state, or if the purchaser has a valid Tax Exempt or Resale Certificate (an actual resale certificate must be presented or a copy held on file with Empire Auction).